It's time for Weekend Cat Blogging #7! Food Bloggers around the world unite each week and share pictures of our favorite felines. See cute cat photos and discover yummy food blogs.We'd love to have you join us. Just send your permalink in a comment to Clare at Eat Stuff and add a "Weekend Cat Blogging" tag to your post. Finally, after three years, a face to go with the name! 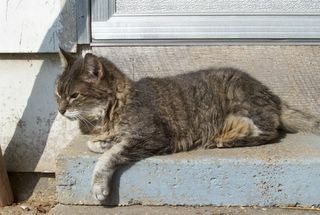 oooh I love old kitties...so special. My first cat lived to 20. Gretel is precious sunning herself. Awww... she looks so relaxed. I had a cat growing up who lived to be 21 years old. I bet Gretel has many more years ahead of her. Hi farmgirl - Gretel looks beautiful, I thought she was a kitten at first, is she very small? Thanks for all the nice comments. Gretel is a real sweetheart. Spoiled rotten, but a sweetheart! She gets about ten treats a day--literally. Boy, does this girl love her raw meat (especially venison)! Besides being deaf and having a little arthritis, she is doing just fine and hopefully will be with us for a long time to come.